The US is the first country outside New Zealand to be licensed to grow and sell the new Dazzle apple, launched last year by Fruitcraft – a collaboration between New Zealand’s three largest apple growers, Mr Apple, Bostock New Zealand and Freshmax. Fruitcraft announced today (23 May) that it has signed a license agreement with US Washington State growers Chelan Fruit and Gebbers Farms, who farm 14,000 and 13,500 acres respectively. Fruitcraft manager Steve Potbury said Chelan Fruit and Gebbers Farm have been granted the rights for production in the US and marketing rights for the fruit they grow. “This is the first step in the global licensing of the Dazzle programme,” he said in a statement. “It gives growers in the US the ability to grow Dazzle and sell it around the world. Chelan Fruit and Gebbers Farm have committed to planting 3m trees over 12 years, and they will be marketing their fruit through their jointly owned company Chelan Fresh, one of the world’s largest apple sellers. “This will strengthen the positioning of Dazzle on the global markets. More fruit will help establish the market more quickly and create a stronger following for the brand internationally.” Potbury added. 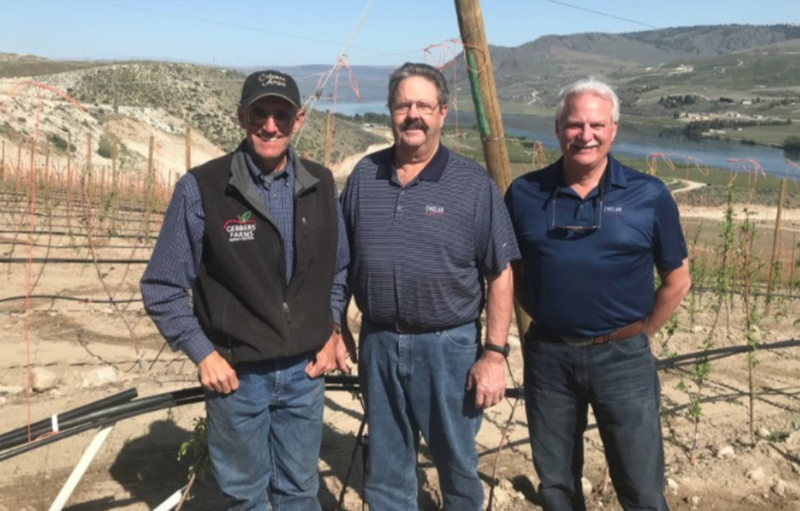 President of Gebbers Farms Cass Gebbers and CEO of Chelan Fruit Reggie Collins said they anticipate the first commercial plantings to start in 2020. Chelan Fresh Marketing CEO Tom Riggan added that the Dazzle apple offers Washington Growers opportunities for sales in the US and for exports. Dazzle branded apples are grown on trees of the variety PremA129, bred in New Zealand, trialled over many years and owned by Prevar Limited. Prevar licensed global production and marketing rights to Fruitcraft. Over 100,000 PremA129 trees are now planted in New Zealand, with a further 250,000 trees to be planted this winter.